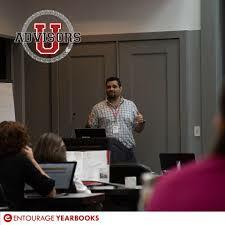 Entourage Yearbooks has created a new initiative to better utilize the the skills of their accomplished advisors and customers by giving them the opportunity to do what they do best: teach! The group, known as the Advisor’s Council, will provide mentorship to advisors who would like assistance in developing best practices for their yearbook curriculum. Using the new Ask the Advisors link, new yearbook coordinators will be able to reach out to the Advisor’s Council for guidance and support. New advisors also have the opportunity to pose a question to the entire yearbook community within Entourage’s collaborative Discuss section on the website. “We already know the ways our own team can help new advisors and educators," said Sara Aniano, a part of Entourage’s Marketing team. “But we also wanted to give advisors an opportunity to contact the people who have truly been in their shoes and know best how to work the project into a classroom setting." In addition to providing support to members of the yearbook community, the group will also assist in the creation and presentation of professional development programs, such as workshops offered by Entourage, so that the community will have ample opportunities to learn and grow. Some of these workshops will be hosted at the annual Yearbook Advisors’ Conference in July 2016, while others will be hosted throughout the year. The next event is the S.Y.T.E. (School Yearbook Technology & Education) Workshop, and will be hosted in Princeton, New Jersey, on December 10th and 11th of this year. Entourage plans for this workshop to be the first of many events that help the yearbook community. For more information on the Advisor’s Council, or how to attend future workshops, contact Sara Aniano at sara(dot)aniano(at)entourageyearbooks(dot)com or 888-926-6571, ext. 38.